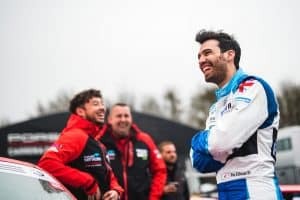 After securing a first Porsche Carrera Cup GB win for itself, Slidesports Engineering, and Tio Ellinas, DVF Racing followed up on Sunday with a further haul of points which places it firmly in the championship hunt. Ellinas drew fifth place for the partial reverse grid race two after his victory on Saturday and made a good start, quickly moving into fourth. With a mid-race safety car bunching the field up he looked left and right trying to pass title rival Dino Zamparelli but wasn’t able to make a clean move for another podium finish and, playing the long game, decided to bring the car safely home with more points. The DVF Racing team will next be in action at Monza in Italy on May 11, 12, 13. Free practice takes place on the Friday, with race one on Saturday, and race two on Sunday morning.